The women’s motorcycle community is changing every day: new riders, new events, new magazines, new gear manufacturers… And while this is certainly an exciting time for our niche, I often find myself craving the insight of someone with experience. Especially when it comes to motorcycle gear. Enter Joanne Donn, a fit consultant at Revzilla’s flagship store, who writes about motorcycle gear on her blog, GearChic. She’s been riding since 2003, and has worked in the motorcycle apparel retail business for nearly as long. 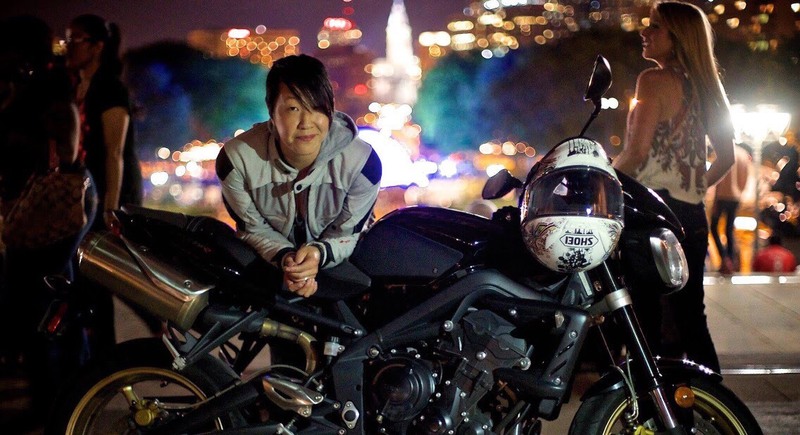 But, fifteen years later, not only is she an active, passionate contributor to the riding community, she rides a Triumph Street Triple, loves aggressive riding, and is really getting into track days. Did I mention she’s five-foot-two? Joanne is a perfect example of the adage, “You’ll never know unless you try.” I think you’re going to love what she has to say. In the early 2000s, Joanne and her husband bought a 50cc scooter, to which Joanne credits her entire riding career. Joanne spent a year riding that scooter around San Francisco, and still believes scooters are the best choice for big-city riding. After awhile, Joanne’s husband got tired of asking her to borrow the scooter all the time, so he upgraded to a Ninja 250… and eventually she stole that one, too. It was around this time that Joanne started thinking seriously about her gear. On the scooter, Joanne wore what she considered to be pretty decent gear at the time. She had a “real helmet,” a Vanson textile jacket and Dainese gloves. Like many new riders, she considered long pants and close-toed shoes to be enough. But after upgrading to a motorcycle, and starting to ride farther, Joanne realized she needed more from her gear. Around the same time, Joanne started a part-time job in the apparel department at a local dealership, which dramatically changed her perspective on motorcycle gear. Since starting her job at the dealership, Joanne has contributed nonstop to the women’s motorcycle community. She started GearChic in 2007 to help other women riders choose the right gear, and began giving seminars about motorcycle gear in 2008. Now, Joanne has been working in motorcycle apparel and writing her blog for more than ten years. In that time, she’s worked with a lot of customers, and she’s learned to find a balance between her customers’ wants and needs. When a customer comes in, Joanne starts by asking them all kinds of questions. What kind of styles are they looking at? What are their priorities? Overall budget? Fit concerns? What kind of weather do they expect to ride in? Most people do come in with ideas about a particular style or brand, said Joanne, so it’s her job to make sure that item fits the customer, so it will perform the way it should. But also, Joanne has to listen to what the customer says they need, and help them think long-term about which products will live up to their expectations. Of course, for most people, one of the most important things about gear is how it looks. “The majority of people are very concerned with the aesthetics and style,” Joanne said. Joanne appreciates this, but she cautions that if you want both style and protection, you’re always going to have to prioritize. According to Joanne, the issue with much of the casual, style-focused gear is that the manufacturers start with the style, then try to add protection. When trying to figure out if a piece of gear is going to protect you, Joanne says first to check for the basics — such as CE-rated armor — and then take a look at the fabrics. She also said to look for technical features that show the company has given “some thought to what a rider might need while they’re actually riding.” For example, vents that are easy to open, even when you’re wearing gloves. But also, Joanne said it’s important to make sure the brand has some kind of “established online recognition,” so you know the company is reputable. Even if they’re new, Joanne said, there should be something out there that indicates this company has done their homework, and that they care about protecting the riders who wear their gear. As I mentioned in the intro, Joanne’s passion is sport bikes, and last year she attended two track days, which she says really changed her riding style. If you’re looking into a track day, Joanne says, it’s important to pick one that suits your needs. Some track days, like the ones offered by CLASS, are specifically geared to help build street-riding skills, while others are more about race techniques. You don’t learn enough on your own. Sure you figure stuff out… but you’re always going to figure out more. Whether it’s a track day, an intermediate skills class, a workshop on basic motorcycle maintenance or a new hobby that’s completely unrelated to motorcycles, Joanne believes it’s important to keep learning. “Any kind of learning keeps you open,” she said. A theme that kept coming up in our conversation, from gear education to riding skills, is that you should of course do what you want. “It’s your movie,” said Joanne. Just make sure you’re informed. Ride your own ride, and don’t let anybody tell you what you can do or can’t do. But make sure you’re approaching it in a really smart way. A huge thank you to Joanne for her time, and for everything she’s done for the women’s motorcycle community. I am now a fan of “The Donn” and have kissed the proverbial ring (i.e. signed up for GearChic), because, like you, LT, she knows what she’s talking about. BONUS: I just, as of your post, found out she works for RevZilla … LOVE that company!!! Big fans of Fit Specialists Peter H. and Peter V. and always enjoyed Anthony B.’s reviews with High-Viz Brian – made me want to buy everything in the store. Sorry to hear he stepped down. I just wish the company would establish a “Staff Recommendations” or “Editor’s Pick’s” page for the veritable truckload of gear they have to help make it a little easier for the customers to make a decision (hint, hint, Joanne 😉). Another sweet read, LT. The Donn’s (hope she’s cool with that nickname) take on track days hits home. I always remind people of a quote from the late, Comedian Bernie Mac: “If you want to be good at something, you have to go to school.” He wasn’t necessarily talking about the brick-and-mortar variant; but sometimes that’s needed also. Thanks for turning your readers’ respective radars onto cool concepts and cool people, LT. Thanks for always expanding our horizons.